This blog post was co-authored by Eric Hudson, Senior Product Marketing Manager, CADD & AI. We are excited to announce the general availability (GA) of the Business Critical service tier in Azure SQL Database Managed Instance! Managed Instance is a new deployment option in SQL Database that streamlines the migration of SQL Server workloads from on-premises to the cloud and combines the best of SQL Server with all the benefits of a fully managed database service. The Business Critical tier is built for applications with the highest performance and availability requirements, and is the optimal choice for mission-critical workloads. These performance and availability capabilities are delivered via several isolated Always On replicas and super-fast local SSD storage resulting in minimal latency and the highest IO throughput. In addition to premium IO performance and high availability, Business Critical also supports features such as in-memory OLTP, additional read-only replica (Read Scale-Out), and flexible database layouts that reach the file limits of the SQL Server database engine (up to 32,767 files per database). For the detailed comparison between the General Purpose and Business Critical service tiers, please refer to the documentation page. We are also excited to introduce new capabilities across both Managed Instance service tiers, General Purpose and Business Critical, that simplify SQL Server migrations. Now available in preview: instance-level collations and Azure Active Directory (AAD) logins. Instance-level collation allows you to choose collation for the system databases (catalog metadata) and align collations between user databases and tempdb, making migration of localized SQL applications to Managed Instance possible without any extra coding. AAD logins enables the specification of users and groups from the Azure Active Directory tenant as true instance-scoped principals, capable of performing any instance-level operation, including cross-database queries. With AAD logins support and federation between on-premises Active Directory and Azure Active Directory, Windows principals can be fully mapped and migrated to the destination Managed Instance. Centralized user management in Azure optimizes security with a single sign-on experience. These features continue to build on the instance-scoped SQL Server model that includes other features, such as: native database restore, user-initiated backup, cross-database queries and transactions, SQL Agent, Database Mail, Service Broker, Common Language Runtime (CLR), Change Data Capture, instance-scoped SQL Audit, catalog views and DMVs. We have also extended more of our SQL Database platform features to Managed Instance to ensure a smooth production experience once workloads have been migrated. Use point-in-time-restore (PITR) to configure backup retention at the database level to control the interval of time, from 7 to 35 days in one-day increments, required to recover your data from a user or application error. Mission critical applications require a reliable cross-region disaster recovery solution. An auto-failover group can now be easily configured between two managed instances running in different Azure regions. 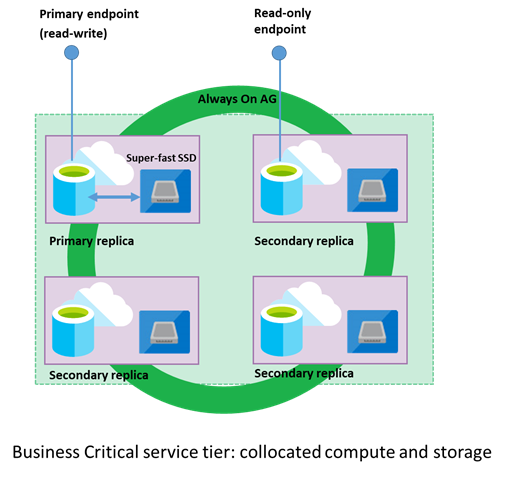 An auto-failover group is an extension of active geo-replication that allows the automatic recovery of all user databases hosted on managed instance in a secondary region. This can significantly mitigate the full or partial loss of data resulting from a catastrophic failure or other unplanned event. Additionally, readable secondary databases in the DR region can be used to offload read-only query workloads. Transparent Data Encryption (TDE) for Managed Instance now supports Bring Your Own Key (BYOK) scenarios through the integration with Azure Key Vault, Azure’s cloud-based external key management system. Important management tasks including key rotations, key vault permissions, deleting keys, and enable auditing/reporting on all TDE protectors using Azure Key Vault functionality can now be controlled with BYOK support. Networking security is now significantly strengthened with the introduction of a built-in firewall. The firewall is automatically configured as part of a managed instance deployment and provides full inbound protection. It allows minimal access to the management endpoint deployed in a subnet for IP ranges belonging to Microsoft management and deployment services, which run outside of the virtual network. Microsoft will automatically maintain this firewall after an instance deployment to reflect any change to the management service IP range. Applications hosted on Managed Instance can leverage Azure platform elasticity through the online update service tier operation, that allows independent scaling of compute and storage, ranging from 8 to 80 vCores and from 32GB to 8TB, respectively. The Business Critical general availability not only allows for up and down scaling within a selected service tier, but also changing the service tier from General Purpose to Business Critical and vice versa, without application downtime, according to the workload’s requirements. Migrating data to a fully-managed, intelligent database service without costly code rewrites can yield significant capital and operational savings. According to Forrester Consulting’s Total Economic ImpactTM study, Managed Instance provides a 3-Year ROI of up to 212 percent, CAPEX savings from avoided hardware, storage, networking costs of up to $800k / per year, and productivity gains of up to 40 percent for in-house DBAs and 20 percent improved productivity for the IT team1. In addition to these benefits, costs can be reduced even further - up to 80 percent - with the Azure Hybrid Benefit and new reserved capacity pricing, which is now available for the Business Critical service tier. For dev-test workloads, we recommend our Enterprise dev-test or Pay-As-You-Go dev-test pricing to save up to 55 percent off license-included rates. To get started quickly with Managed Instance, visit our documentation home page and try a 5-Minute Quickstart to easily configure the Azure network for Managed Instance or create or scale Managed Instance from the Portal, PowerShell, Azure Command line and ARM templates. If your workload demands optimal performance, deploy the Business Critical service tier and leverage premium IO performance, high availability and features such as in-memory OLTP or additional read-only replicas (Read Scale-Out). To optimize your experience, install SSMS 18.0 (preview 5) to take advantage of our recently added features: AAD logins and transactional replication, as well as improved scripting and UI for credentials and audits. Monitor the performance of your Managed Instance databases, setup automated alerts, and use the artificial intelligence to automatically troubleshoot performance issues with Azure’s native cloud monitoring solution, Azure SQL Analytics. We’re excited for you to try SQL Database Managed Instance and experience virtually hands-free administration at the lowest TCO on all your SQL Server databases. Try Managed Instance today and let us know what you think! 1“The Total Economic Impact™ of Microsoft Azure SQL Database Managed Instance,” a commissioned study conducted by Forrester Consulting on behalf of Microsoft Corporation, Oct 2018.